You know how it feels when you've been doing something you like so much and then suddenly a storm of commitments come up and you have to let the fun thing go for a while? You remember how good it feels to be able to do the fun thing again? Well, that's what it was like to work on this month's Art Bead Scene challenge! I completed most of the Challenges in 2009 and then 2010 just shot by and I only got one finished and posted. I vowed that this year I would get back in the groove and do as many as I possibly could. By the end of 2009 I had a nice body of work that showcased my skills for any art jury that needed examples of my best efforts for shows and competitions. Although the challenges were time-consuming, I loved doing them. 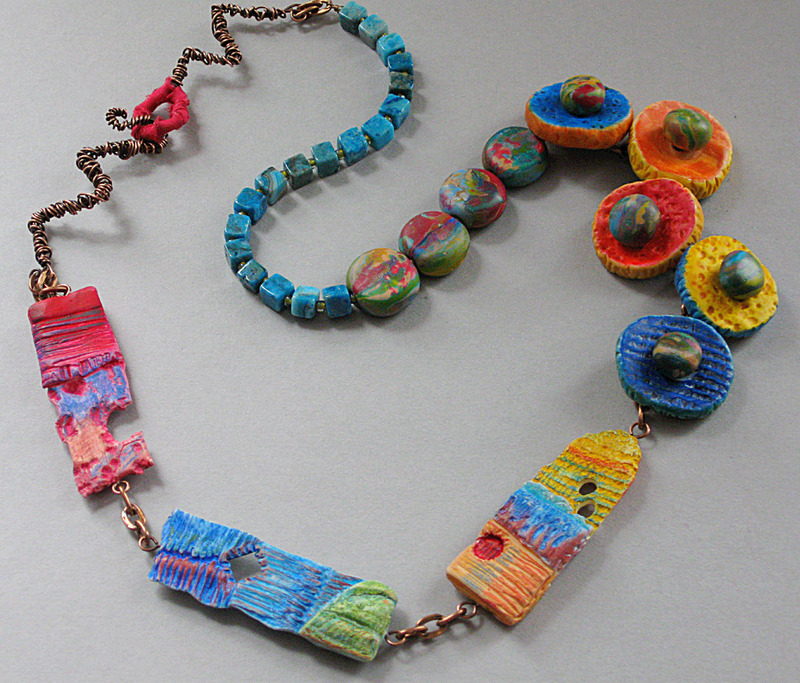 They stimulated my brain and developed my skills, both in creating art beads and in stringing them. Since I've become a serious, every-day-at-the-bench artist, I need to put myself in the way of design problems to solve-- they don't just show up in rural Vermont life. So the gauntlet was absolutely thrown down when the painting to interpret was revealed to be one of the “Brown River” series by Wayne Thiebaud, a lively work depicting the Sacramento Delta in California, done in a primary-based palette of clear, saturated color blocks. I never work in these colors. I don't do modern. Besides, doesn't Wayne Thiebaud do pop art pies and cupcakes? But I did ask to be challenged, didn't I? I had gotten what I asked for-- in spades. The colors were challenging, the shapes were challenging. I wanted to use a new technique with oil paints and pencil but the beads I made weren't right for the application. I filled page after page of my sketchbook with ideas but it just wasn't coming together. When I was in art classes in college, we would be assigned a design problem by our instructor and I would do what I called “throwing it into the 'creative soup'. I wouldn't think specifically about the problem for awhile; rather I would just go about my daily activities and wait for inspiration to strike. And it did, eventually. The lightbulb would suddenly go on as I shopped the art supply stores in Soho or listened to jazz or browsed some local galleries or even read a book. I found that activities unrelated to art frequently stimulated the brainstorm I was looking for. In the course of an e-mail conversation with Barbara Lewis she recommended a new book from North Light Books by June Roman, "A String of Expression: Techniques for Transforming Art and Life into Jewelry". I ordered it and reading through the projects sparked inspiration for some quickly-made textured shapes that were slightly disintegrating. I envisioned these as pendants but couldn't make it work so I decided to string them in sequence. Next came textured clay coins that were colored with alcohol inks and liquid clay. I took some clay scraps in the painting's colors, chopped them together, and ran them through an extruder to make some mokume gane beads and headpins (it's a technique borrowed from Japanese metalworking). Twisted copper wire became the “brown river” and some larimar cubes completed the stringing. My husband suggested that the long length of wire work needed a color break and he was right so I wrapped half of the clasp in red silk. When Thiebaud spoke at Harvard University School of Design in 1990, he responded to a student question: "What do you think defines an artist?" with "An artist creates his own world!” Amen. Your designs and beads always leap off the screen to me. They are imbued with a sense of life and movement and harmony. These beads are perfect in their interpretation of the painting. And I knew it was you before I read the name! I fell off the ABS bandwagon in 2010 as well. My goal is to do ALL 12 of the challenges this year whether I am grabbed instantly by the painting or not. I need that challenge and that sense of play. We can be ABS buddies to spur each other on! And I need to develop a more cohesive and rich body of work. I am hoping this does just that. Enjoy the day! Wow, this is really fresh! Good enough to eat! Erin, you can absolutely be my ABS buddy! Thanks for asking me to play with you-- anytime! Oh COOL! That is so awesomely neat! Not what I expected! Which is a good thing! I LOVE, love your interpretation of the painting. The colors are so fresh and vibrant. Your determination has paid off! I should follow your lead and strive to participate in all 12 challenges. However, I gave up on this months challenge, as my piece was not turning out the way I planned. Maybe I should visit it again...even if I don't get it done by tomorrow. Excellent job! Hey - you can't say you don't do modern anymore now! Fabulous! Thanks you for sharing your process. Christine, you know how completely I was when I first saw your necklace...and I am still. Your various textured shapes are amazing...I'm still wondering how you created these. I wish I could just reach out and touch them. :-) The twisted wire for the brown river is genius as well. What a fabulous ABS challenge piece! Fascinating and so very different from other pieces I have seen of yours. I assume you added the red silk after this picture. I will have to take a look at that book - thanks for sharing! I totally love this necklace. Brilliant. What a gorgeous necklace! Congratulations. Thanks for sharing this. Your work is Sublime is all I can say! I found your work intriguing and came to visit your blog. I also work with polymer clay to create art beads and am so glad there are more artists joining the ABS challenges with this medium. We can create so many custom colors and textures and faux finishes with clay. I will certainly be back to visit and hope to get to know you better this year.